*1/4 color CCD ,440,000 pixels. electronic zoom 12x,opitc zoom 18x. can be focus by manual or auto and auto-focus distance150-500mm. *display images real-time, freezing, storage, delete, image-magnify or dwindle, auto-focus, manual focus, adjust light intensity, green filter, normal real color model choose. 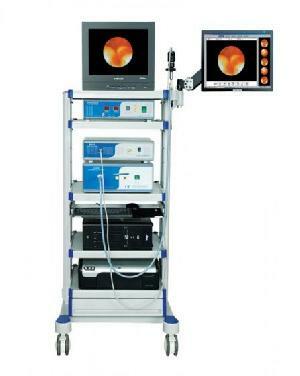 This system can also capture,display,freeze,cecord,playback and store the images of the entire process of observation of the uterine cavity. For each inspection,the system can capture1-30 images in a continuous way,so it is applicable to the dynamic observation in hysteroscope inspection.Special adatabase can be stored in the standard map database,available for doctors group-diagnosis or teaching research. Wich the powerful image management function,the system can access,edit,modify or delete the cases. Company Name: Kernel Medical Equipment Co., Ltd.